China's People's Liberation Army (PLA), the world's largest army, has published an officially approved outline for military training as part of its efforts to emerge as a world-class force. The Central Military Commission headed by President Xi Jinping has approved the outline for military training. Since he took over power in 2013 emerging as China's most powerful leader in recent decades, 64-year-old Xi has been firmly advocating live fire drills in real-time war conditions to enhance the 2.3-million strong military to win wars. As a result, the PLA army, navy and air force have been carrying out massive exercises in Tibet as well as the disputed South China Sea and areas close to Taiwan. 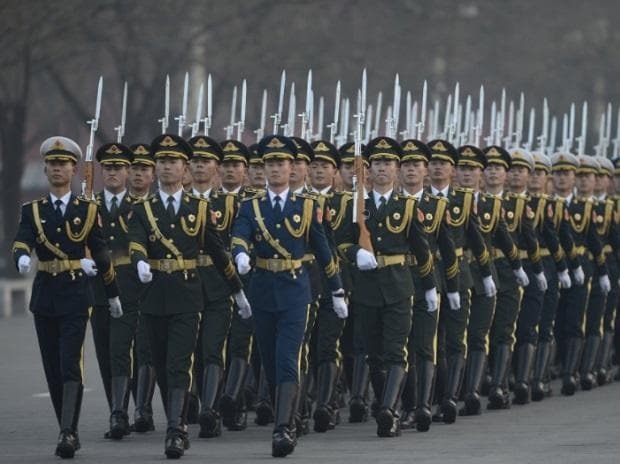 Xi also carried out massive reform of PLA's command structure and ordered three lakh troops cut as part of efforts to revamp the military which has an annual budget of over $140 billion, next only to that of US military. Also over 40 top military officials including two former Vice Chief of the CMC were punished in the massive anti-graft campaign ordered by Xi, the largest purge since the era of Mao Zedong, founder of the ruling Communist Party of China (CPC). Xi also heads the party as general-secretary of the CPC, and the military besides the presidency. Centring on building a strong army in the new era and building it into a world-class force, the new training outline focuses on the PLA's combat capability, highlighting military training under combat conditions and joint training. It looks to establish "a system of training content and related mechanisms that are more into combat and joint operations, as well as more scientific and normalised," state-run Xinhua news agency reported. Moreover, the outline sets up a standard system covering personnel at different levels and in different fields that meets the requirements of modern warfare, laying the basis for the PLA's training, while setting a significant rule for military training in the new era. The latest revision to the outline is the PLA's eighth overall remodelling of the system of the military training content since April 2013, said PLA Daily, the official organ of the military. The PLA will also develop new combat and support forces, increase military strength and speed up development of an intelligent military, to enable itself to shape its military posture, manage crises, and deter and win wars as per the orders of the once-in-a-five-year congress of held in October last. It also endorsed a new five-year term for Xi. The new training outline makes it a mission of the PLA that by 2035, the modernization of the country's national defence and forces should be completed, and that by the mid- 21st century Chinese people's armed forces should have been fully transformed into world-class forces, the report said.